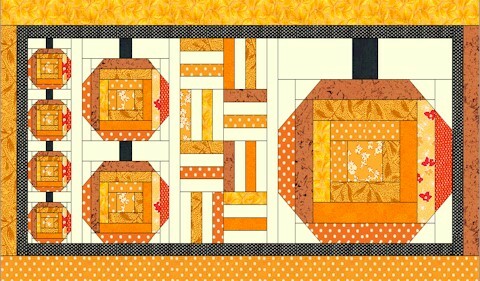 This entry was posted in Quilt Pattern, Quilting, Quilts & Projects: Published, Quilts: Pieced and tagged Fall Quilt, House of White Birches Log Cabins Today, Log Cabin Quilt, Pumpkin Patch Quilt, Pumpkin Quilt, Tablerunner, Wendy Sheppard Designs. Bookmark the permalink. 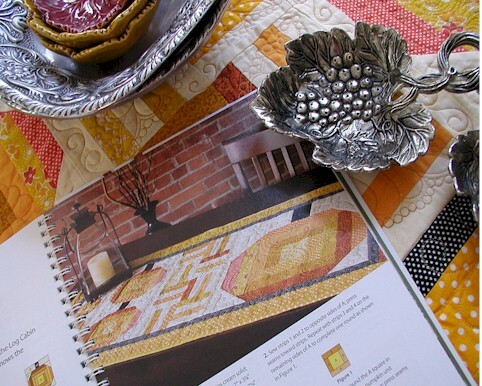 I can almost smell the autumn leaves and feel the pumpkin’s surface… this table runner certainly conveys FALL. 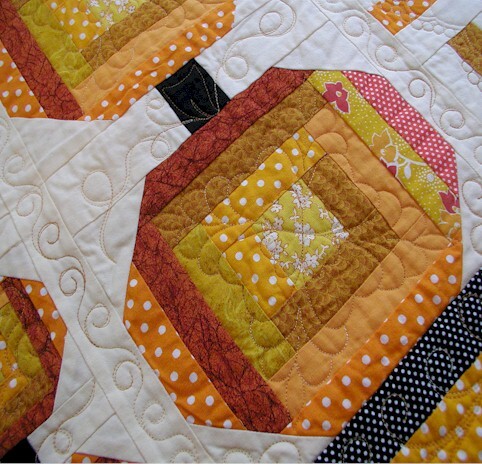 Lovely job and interesting quilting pattern. I voted for Autumn Hues. It’s traditional, yet seemed dimensional, yet fun! But that Bllissful in the Clouds – boy – it was tough decision between the two! Thanks for sharing your beautiful work! The more I see of what is in this book, the more I want to order it! Have been thinking about a Halloween/Thanksgiving wall hanging and tablerunner that would go together. Maybe this my inspiration! Have never been too crazy about decorating just for Halloween but would rather do something that fit both holidays. My favorite is the pumpkin runner. 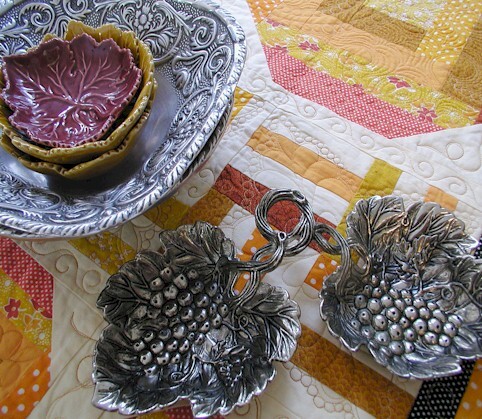 Being the primitive lover I’d have used darker fabrics or tea dyed the colors you used. Your quilting beautiful as usual. It’s hard to choose between Autumn hues, because I like the colors, or Blissful in the Clouds because it is so creative and inventive, but I voted for the latter. They’re all great, though. I had a hard time choosing between Apple of My Eye and Blissful in the Clouds. OK, I’ll admit, I loved the Pumpkin Patch too. 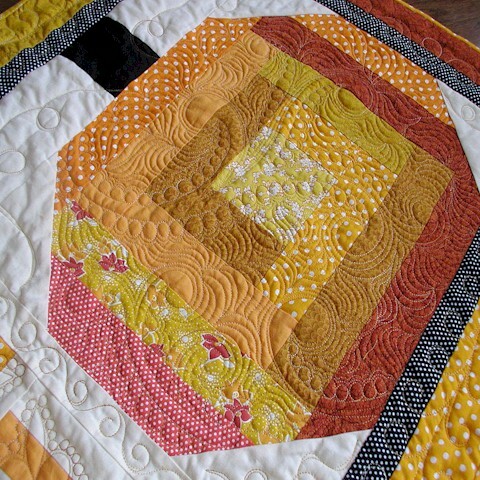 Autumn Hues was not orderly enough to be a fave for me,b ut I still admire your color selection, points & quilting!! In the corner of the pumpkins, you have a little Y-shaped swirly….do you do just that, tie off & move to another section, or do you stitch in the ditch to the next section or what? Inquiring minds want to know how it’s done! Thanks for sharing all your lovelies! I voted for Autumn Hues, but I love them all equally well. I’m going to have to buy this book. I’m not suppose to buyyyyyy anymore books. I have enjoyed the show! I think my favorite would be the kites. Each one of your beautiful log-cabins has a character of its own. 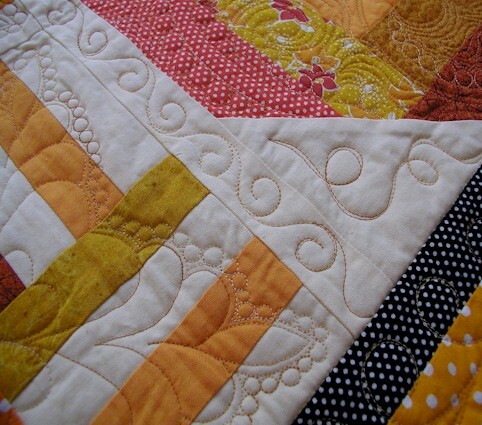 The quilting on each of the quilts are really lovely ….the favrorit is too hard to pick..
Love them all, Wendy! Apple of my Eye is my favorite – I just really like the colors and composition. 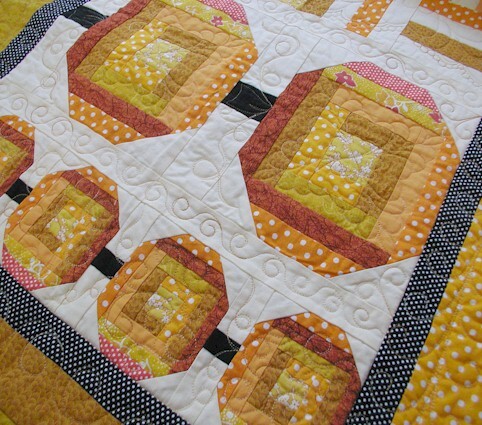 I think I love the quilting on Blissful the best though! I love the bright funkyness of Autumn Hues – although they don’t look at all like autumn colours on my computer monitor! and the asymmetrical setting looks great. This is a toughie. I like all of them. 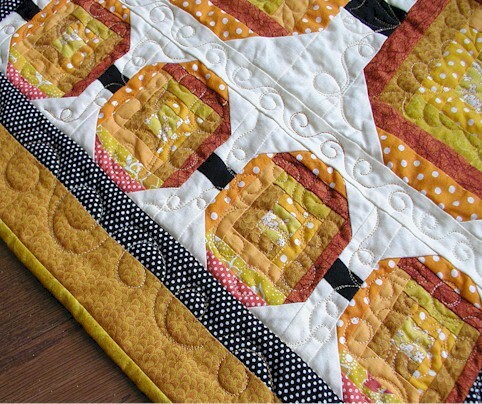 I think my favorite is the apple quilt, but I love the fabrics in your second quilt. We here a House of White Birches a.k.a. Quilter’s World love your projects and are always very pleased to publish them. Keep up the great designs. You are a very talented designer/quilter. Carolyn S. Vagts, editor. It was way too hard to choose one, but I voted. :-) Love the pumpkins today! Have a happy weekend! Hi Wendy, It is really had to pick a favorite but I do like the Apple one–probably because of the colors, I love red. But I love the polka dots in Pumpkin too……..ooh so hard to choose…Like which of your kids is the favorite–can’t do it. 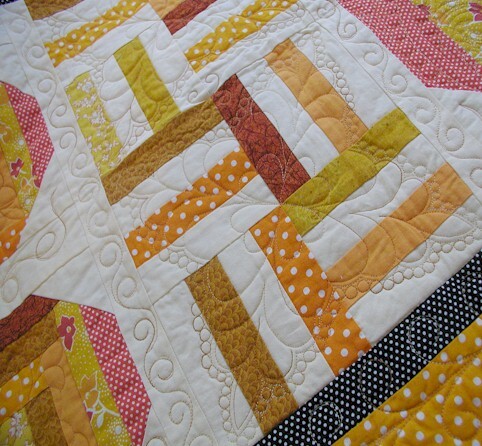 Your quilting is so awesome in all four it just makes me drool. It was hard to pick only one, but I picked this as my favorite because I love the colors and your quilting is just gorgeous on this one. The apple of my eye was a close second, though. 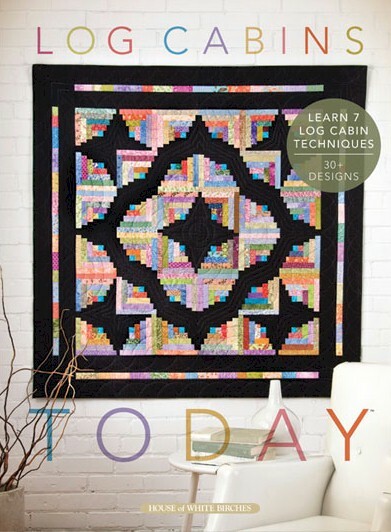 What beautiful and creative ways to use log cabins — all of the quilts are amazing. P.S. Don’t worry about replying to my comment or visiting me. I know how precious time is. I just love the colors in this particular quilt. All of the quilts are beautiful and it was hard to choose. I picked Ivory Spring cause I’m more partial to these colors. Thanks fir sharing. Drawn in by the FB post of the pumpkin tablerunner, very cute, but due to the whimsey, color and movement the Kite takes my vote as FAVorite. Really liked the apple as well (3rd choice). Thanks for highlighting your contribution that looks like a great book. 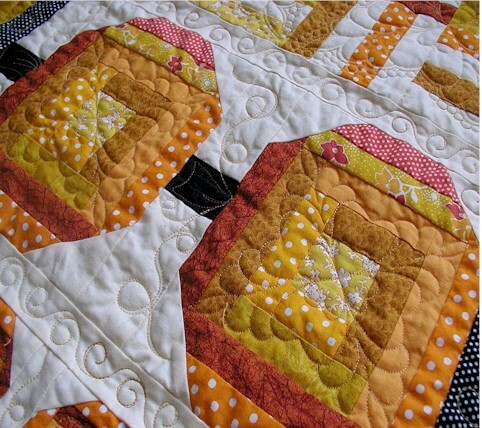 The addition of your telling how and what quilted with was a pleasant bonus.